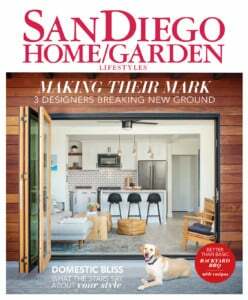 Part of our Secret Lives of Seven San Diegans feature, read about the secret life of Baran Pourfard. She landed her first job here thanks to the fact that she is a sixth-degree black belt in taekwondo and a former member of Iran’s national team, a perennial powerhouse in the Olympics and other international competitions. When a martial arts school saw her pedigree, she became an instructor on her third day in America. Less than a month later, she also picked up a gig repairing rugs, a skill she took a class for shortly before departing for the States. 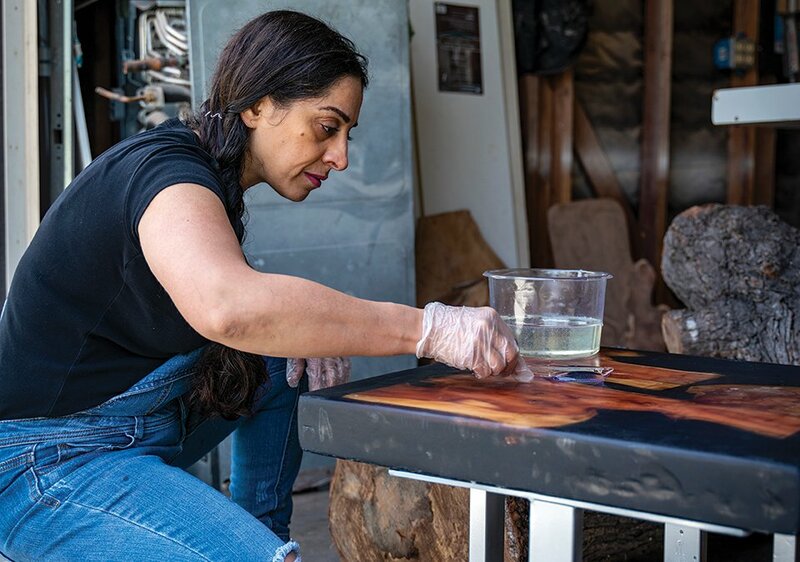 Baran adds the top layer of resin to a table. She eventually landed with Comfort Furniture, where she has been for 10 years. And given her background as an honors student with a bachelor’s degree in interior design and an MBA in international marketing from the University of Tehran, it’s no surprise she has a cascade of glowing Yelp reviews for her work at the decades-old, family-owned furniture store. But Baran has now set about mastering another skill: furniture maker. 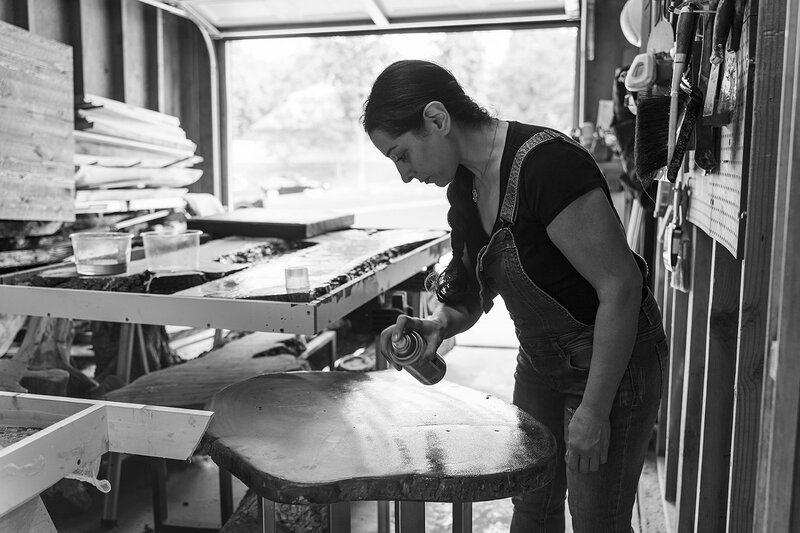 Though her grandfather was a skilled woodcarver whom she would watch for hours as he made simple household items, he never taught her how to do it. “Girls were seen as delicate and should not do things like that,” she says. 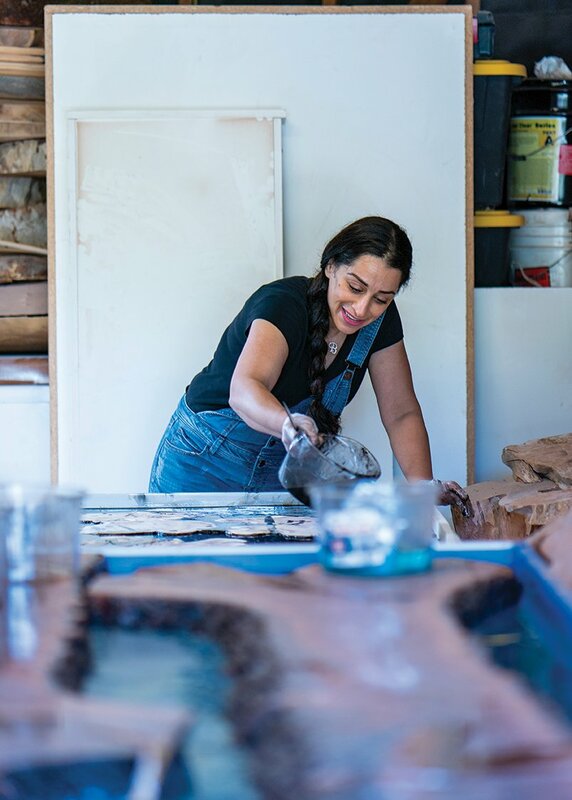 So with an assist from a woodworking class at Palomar College, she began making tables that have grown increasingly exotic and artistic, incorporating live-edge wood, resin and metal. Her passion for it has only grown and she has launched her own side-business, Queen Baran Design. 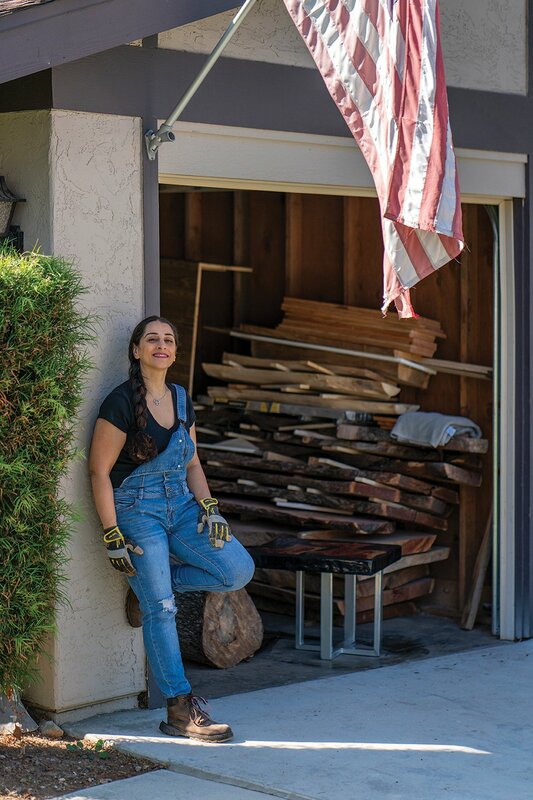 “When you work with wood you have to really love it because it’s a super-hard job,” she says. “But I have started at 6 or 7 o’clock in the morning and finished at 10 p.m. and I didn’t even notice it was that many hours. 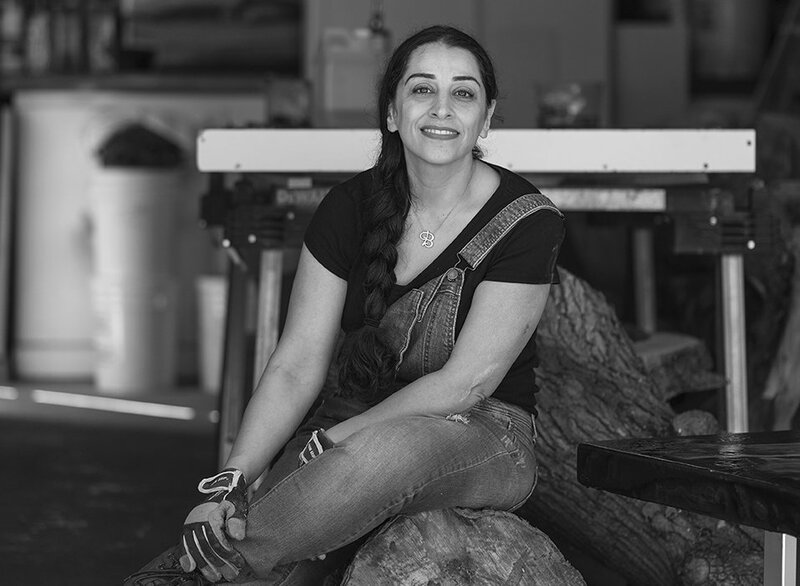 Baran’s work incorporates live-edge wood, resin and metal. 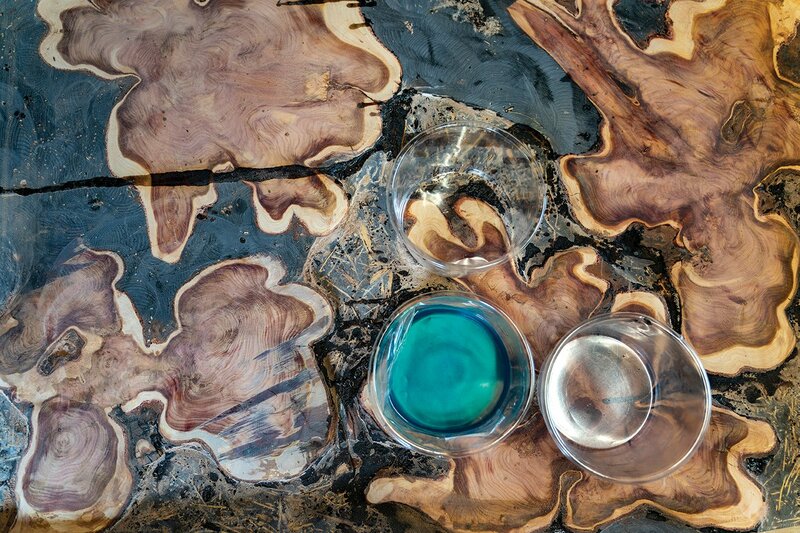 Here, a blue resin is added to a tabletop.